Bring in or show us the coupon below for $40 off any of our designer tuxedos! -Step 1: Find out the color you need. -Step 2: Stop in to see tuxedo styles, choose colors, and get fitted. -Step 3: Pick up your tuxedo rental the day before the prom. TRY IT ON!!! -Step 4: Return your rental the day after you use it. Dress rentals start at just $49! 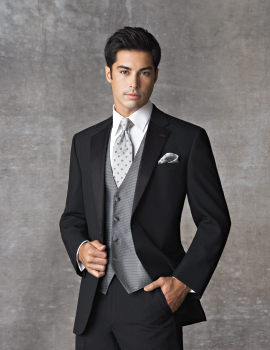 Fifty-Fifty Tuxedos also has the largest in stock selection of tuxedos in Berks County. Over 4,000 tuxedos and 2,000 pairs of shoes in stock for you to see, feel, and try on. No matter the occasion, Fifty-Fifty Tuxedos will have you looking your best this prom season! Site content copyright Fifty Fifty Tuxedos 2011 - 2012. All images, logos, artwork etc. are copyright to their respective owners.